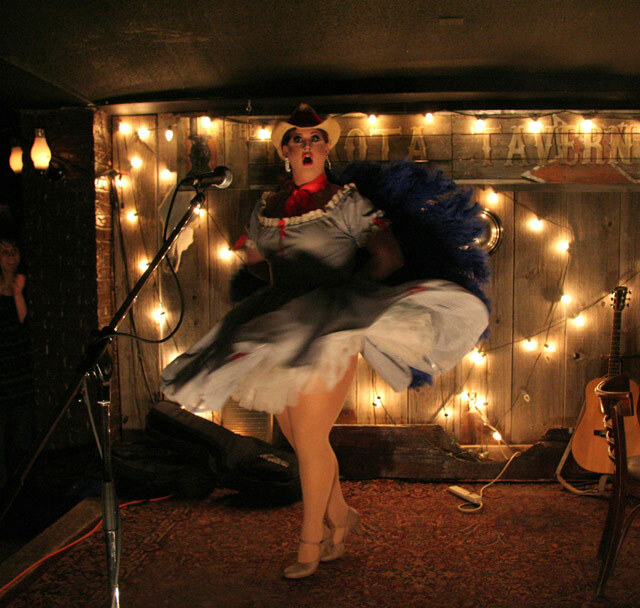 Photo of Ms.Conception at Steers and Queers by Sonya Reynolds, courtesy of Sketch. DANCE: A taunting line from R. Lee Ermey’s sergeant character in Full Metal Jacket (“Only steers and queers come from Texas, Private Cowboy. And you don’t look much like a steer to me so that kinda narrows it down.”) is turned on its head in the fifth installment of Steers and Queers, a gay cowboy dance night at the Dakota Tavern. This is a typically sold-out event with dirty line-dancing lessons and DJ Sigourney Beaver spinning. The Dakota Tavern (249 Ossington Avenue), 10 p.m., $5. MUSIC: Local indie bands perform in the name of eliminating genocide in Darfur in an event hosted by STAND Canada, an organization devoted to this same cause. Pop rock outfit We Are the Take opens, while Birds of Wales’ slightly mellower sound rounds out the night. This do-gooding rock out goes down at Queen West’s Tattoo Rock Parlour, where the partying continues on the sidewalk afterward much to the chagrin of passing traffic. Tattoo Rock Parlour (567 Queen Street West), 9 p.m., $10 in advance at Ticket Web, or $15 at door. ART: Prints are Like That—a new show at Gallery 1313—showcases the engrossing power of printmaking with the work of thirteen emerging artists whose passion leaps off the page. The punk ethos, long associated with printmaking, is used as a starting point for some artists, like Lewis Cruise, whose work examines the ongoing commercialization of skate culture. Gallery 1313 (1313 Queen Street West), 7 p.m., FREE. POETRY: An exhibition of poetry broadsides opens today at the Toronto Reference Library’s TD Gallery. A broadside—a large sheet of paper with printing on one side—was at one time a popular format for distributing poetry and artwork. Culling broadsides from the Public Library’s special collection and private collection loans, this exhibit features a cross work of famous names: Sappho, Gwendolyn MacEwen, Pablo Neruda, and Dorothy Livesay. Toronto Reference Library (789 Yonge Street), Library Hours, FREE. ART: What started as a one-room art show has now taken over the office of the Delisle Youth Services and expanded into the neighbouring Skylight Gallery. With over 150 pieces from young artists aged thirteen to nineteen, the artwork runs the gamut from installations to musical performances. Delisle Youth Services (40 Orchard View Boulevard), 5 p.m., FREE.